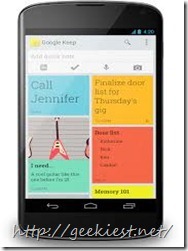 Google officially released Google Keep this week. A new Evernote - like app for Android and PC. 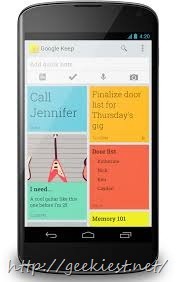 You can create notes, checklist, create photos and voice memos with this app. 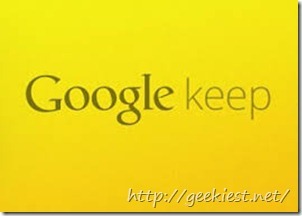 Also Google Keep lets you syncs contents across your device. * Create notes, lists to keep track of your thoughts always. * Capable of creating voice notes. 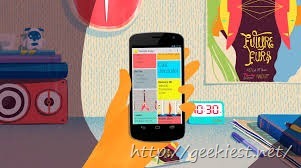 * Homescreen widget allow you to note your thoughts quickly. * You can set different colors for different thoughts, so that you can find them later with ease. * use ‘swipe to Archive’ feature to move notes that you no longer need. * You can add checkboxes to your notes so that you can use it as a checklist. * Information are safely stored in cloud so that you can use it from anywhere and also available on the Web. 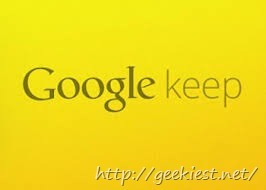 You can watch the official video of Google keep app and you can download this app from Google Play Store.